Does sadness make you sick? We’ve all heard of being “homesick”, or “heartsick”, or “lovesick”. Sometimes when we’re extremely sad, we feel the knot in our stomachs, the pressure in our chests, or the confusion and distraction in our minds as the waves of sadness wash over and discombobulate us. But can being sad really make you physically ill as well as emotionally distraught? Dr Caroline Leaf is a communication pathologist and a self-titled cognitive neuroscientist. She believes that our cognitive stream of thought determines our physical and mental health, and can even influence physical matter through the power of our minds. With all due respect to Dr Leaf, the study she quotes doesn’t prove anything of the sort. Dr Leaf’s meme is a copy and paste of the opening paragraph of a news report published by the university’s PR people to promote their faculty. This isn’t a scientific summary, it’s a hook to draw attention to an article which amounts to a PR puff piece. If Dr Leaf had read further into the article, I don’t think she would have been quite so bold in claiming what she did. The article discussed a study by Prossin and colleagues, published in Molecular Psychiatry . You can read the original study here. 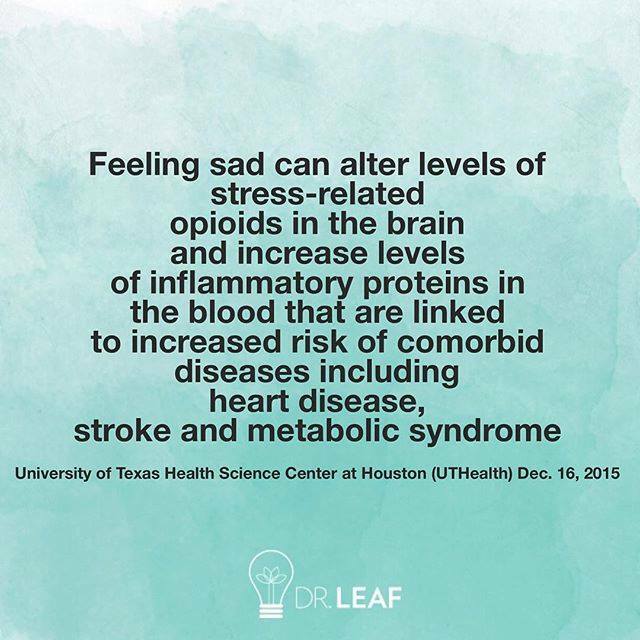 The study specifically measured the change in the level of the activity of the opioid neurotransmitter system and the amount of a pro-inflammatory cytokine IL-18 across two experimental mood states, and in two different groups of volunteers, people with depression, and those without. For a start, it’s important to note that the study isn’t referring to normal day-to-day sadness. This was an experimentally induced condition in which a sad memory was rehearsed so that the same feeling could be reproduced in a scanner, and the study was looking at the effect of this sad “mood” on people who were pathologically sad, that is, people diagnosed with major depression. It’s well known that people with depression are at a higher risk of major illnesses, such as heart attacks, strokes and diabetes  The current study by Prossin et al looked experimentally at one possible link in the chain, a link between a neurotransmitter system that’s thought to change with emotional states, and one of the chemical mediators of inflammation. > Depressed people were much sadder to start with, and remained so throughout the different conditions. The depressed people stayed sadder in the ‘neutral’ phase, and the healthy cohort couldn’t catch them in the ‘sad’ phase. > Depressed people had a much higher level of the inflammatory marker to start with, and interestingly, this level dropped significantly with the induction of the neutral phase and the sad phase. What was also interesting was that the level of the inflammatory marker was about the same in the baseline and the sad phase for the healthy volunteers. > A completely different pattern of neurotransmitter release was seen in the two different groups. People with depression had an increase in the neurotransmitter release over a large number of areas of the brain, whereas in the healthy controls with normal mood, the sad state actually resulted in a decreased amount of neurotransmitter release, and in a much smaller area within the brain. This suggests that the opioid neurotransmitter system in the brains of depressed people is dysfunctional. 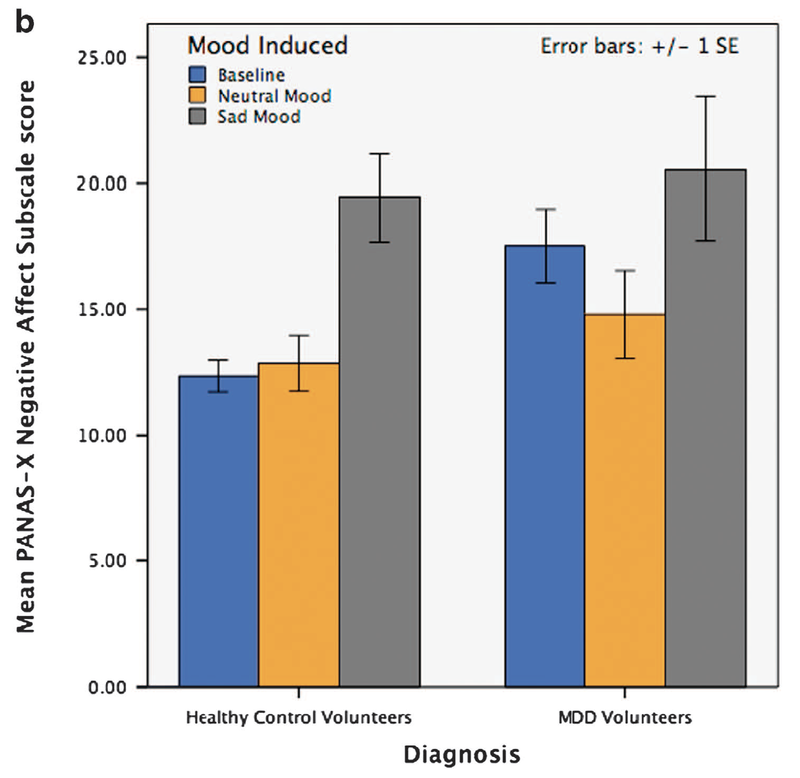 Affect/Sadness Scores – Prossin et al Molecular psychiatry 2015 Aug 18. 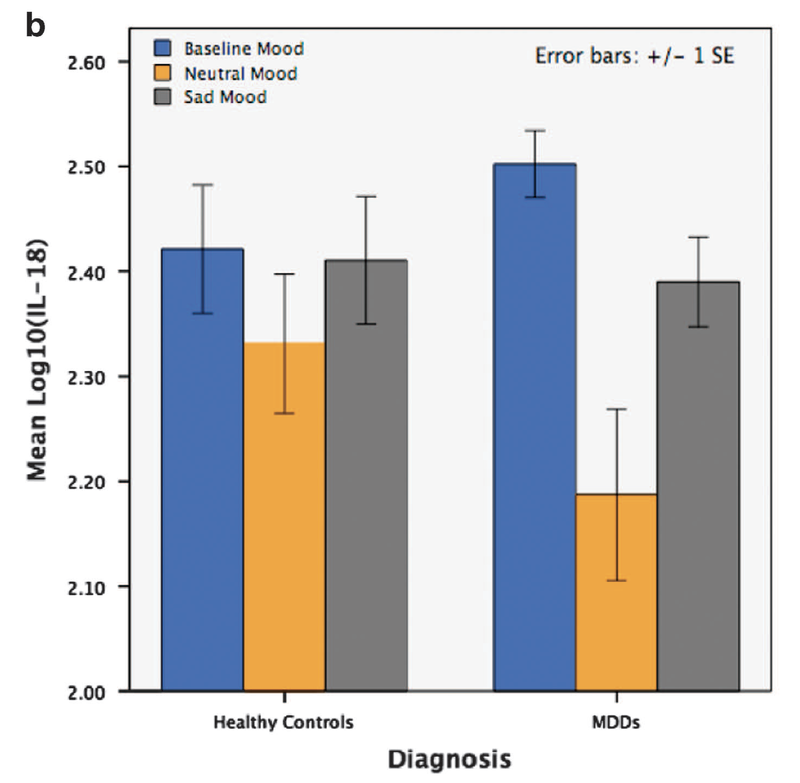 IL18 v Mood state/diagnosis – Prossin et al Molecular psychiatry 2015 Aug 18. Effectively, the results of the study reflect what’s already known – the emotional dysregulation seen in people with depression is because of an underlying problem with the brain, not the other way around. And, sadness in normal people is not associated with a significant change in the evil pro-inflammatory cytokine. normal sadness in normal people is not associated with physical illnesses. 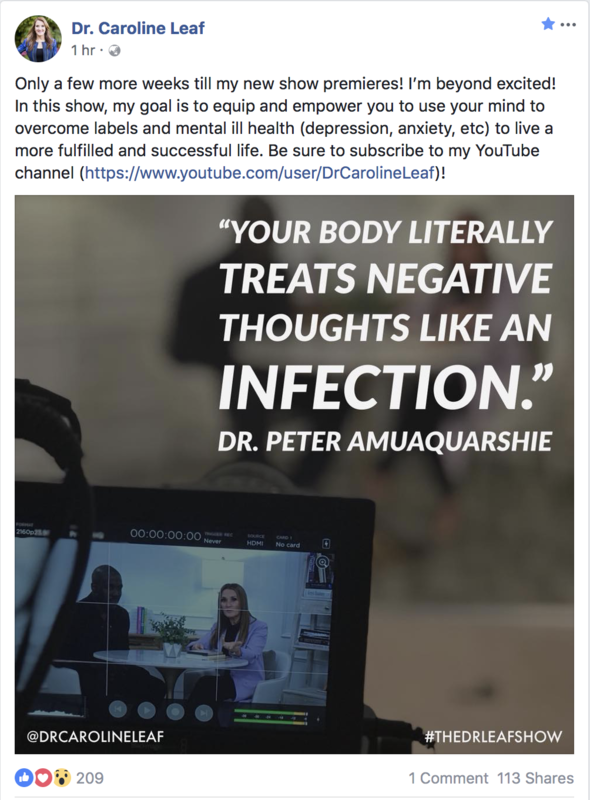 The article is not “more evidence that our thoughts do count.” If anything, it shows that underlying biological processes are responsible for our thoughts and emotions and their downstream effects, not the thoughts and emotions themselves. And unfortunately, it appears that Dr Leaf hasn’t got past the opening paragraph of a puff piece article before jumping to a conclusion which only fits her worldview, not the actual science. Prossin AR, Koch AE, Campbell PL, Barichello T, Zalcman SS, Zubieta JK. Acute experimental changes in mood state regulate immune function in relation to central opioid neurotransmission: a model of human CNS-peripheral inflammatory interaction. Molecular psychiatry 2015 Aug 18. Clarke DM, Currie KC. Depression, anxiety and their relationship with chronic diseases: a review of the epidemiology, risk and treatment evidence. Med J Aust 2009 Apr 6;190(7 Suppl):S54-60. 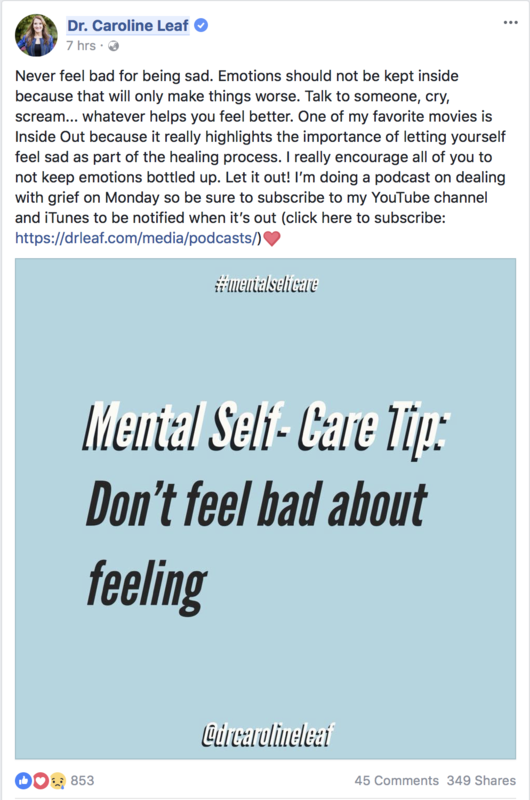 The Prospering Soul – Just what is mental health? The modern western church has two out of three. As modern Christians, we have the fitness of the Spirit pretty well down, and we’re not too shabby on our physical fitness either. Unfortunately, we still have a way to go on the Soul thing. In 2013, Rick Warren stood in front of his church after the suicide of his son, and promised he would work to reduce the stigma of mental illness in the Christian church (http://swampland.time.com/2013/07/28/rick-warren-preaches-first-sermon-since-his-sons-suicide/). Rick Warren experienced the stigma and destruction of poor mental health first hand. So have many others in the church, as have I.
It’s my passion to help the Christian church prosper, our bodies, our spirits, AND our souls. Over the next few months, I’ll be doing a series of blogs on mental health, to encourage and help those in the church battling mental illness, and everyone else in the church to know how to assist them in their battle. Together, we can help to eliminate the stigma and destruction that mental health can bring into the lives of Christians, and that we may prosper in all things and be in health, just as our soul prospers (3 John 1:2). To start with, it would help if we knew what it meant to be in good mental health, and what separates mental health from mental illness. The distinction isn’t always so obvious. There are a few ways to define or conceptualise mental health and illness, but to cut through the thousands of words of medical and scientific jargon, the difference between good mental health and bad mental health is often to do with changes to our thinking, mood, or behaviour, combined with distress and/or impaired functioning. Our mental health is intimately linked with our physical health, and often physical illness will lead to changes to our thinking, mood, or behaviour, combined with distress and/or impaired functioning too, although strictly speaking, that’s not a pure mental health disorder. What IS important for the average church goer to understand is that we all experience some changes to our mental health at different times in our lives. For example, we all experience grief and loss at some time in our lives, and at that time, it’s normal to experience extreme sadness, sleeplessness, anger, or guilt. What differentiates grief from depression is the trigger, and the time the symptoms take to resolve. In general, how we perceive our thoughts and behaviours, and how much any signs and symptoms affect our daily activities can help determine what’s normal for us. then consult your family doctor or psychologist, or encourage your loved one to seek help. With appropriate support, you can identify mental health conditions and explore treatment options, such as medications or counselling. Many people who have mental health conditions consider their signs and symptoms a normal part of life or avoid treatment out of shame or fear. If you’re concerned about your mental health or a loved one’s mental health, don’t hesitate to seek advice. If you or a loved one have, or still struggle with, mental illness, I welcome your comments. National Institute of Mental Health, Mental Health: A Report of the Surgeon General, U.S. Department of Health and Human Services, Editor 1999, U.S. Department of Health and Human Services, Substance Abuse and Mental Health Services Administration, Center for Mental Health Services: Rockville, MD.